The global paperweight on his office desk in White Plains is inscribed with place names that chart lawyer Charles Goldberger’s recent annual travels abroad. They read more like a Cold War spy’s postings than an American tourist’s typical European itinerary: Tallinn, Estonia; Bucharest, Romania; Belgrade, Serbia; Szczecin, Poland. This fall, Goldberger can add Vladivostok, Russia, to that list. The lawyer is accompanied abroad by his wife, Micaela. A marathoner who has aged into half-marathons, he also brings his running shoes and seeks the sporting, sociable company of running clubs in the cities he visits. Rotary clubs too are regular stops and meeting places in Eastern Europe for Goldberger, a 35-year member of the Rotary Club of White Plains. In 2006, Goldberger responded to “a blind email” from the American Bar Association about a newly launched teaching program abroad for American lawyers. The Center for International Legal Studies, based in Salzburg, Austria, was seeking senior lawyers with at least 20 years of practice in English and American common-law systems to teach without pay at law schools in Eastern Europe and in the former republics of the Soviet Union. 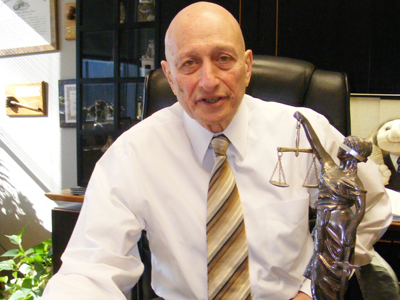 Goldberger was at a point in his career where he no longer tried as many cases. “And I don’t play golf,” he said, “and I can’t stand sitting on the beach and I don’t like fishing.” He and his wife do love to travel, however, and so he jumped at the chance to be among 50 lawyers chosen to teach in the first year of the cooperative program. “When I was there, Estonia was the most Westernized of the former Soviet Union nations,” Goldberger said. “It’s very much a free-enterprise system.” In law circles, “They were very interested in modernizing their system” and were “picking and choosing” from the U.S legal system. Goldberger dressed casually for class to help put his students at ease. Though the visiting teacher at times relied on interpreters, the language barrier proved less of a challenge. “In the last 20 years, English has become the language of commerce in Eastern Europe,” he said. “It’s replaced Russian and even French,” the continent’s older language of commerce. In Europe, students go from high school to law school in undergraduate university programs, he said. In Poland, where he taught last fall, students attend five years of law school and complete a one-year internship before taking a national bar exam to become lawyers. Polish students were especially interested in the 14th Amendment to the U.S. Constitution and its equal-protection clause. The right to equal protection under the law hits home for Poles as members of the European Union. “That is becoming a big issue in the EU, the people of Poland vis-à-vis the people of France,” Goldberger said. Despite political tensions at the time between the U.S. government and one of his host countries, Serbia, Goldberger said he has been welcomed as an American by citizens in every country. “In Estonia, we were credited with helping to free them from the Russians,” he said. “And it was the same thing” in the other former Communist countries. “Romania was the backward and still most similar to the Russian system,” he said. His wife might skip that trip, the lawyer said. His running shoes and Hollywood law flicks he’ll bring.